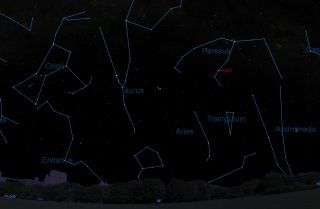 This sky map shows the location of Algol, the Demon Star, in the constellation Perseus in the western night sky on Feb. 19, 2015 as seen from mid-northern latitudes. The so-called "demon star" of Algol is the most prominent eclipsing variable star in the night sky, and if you know when and where to look, you can see the star appear to wink as it is eclipsed by another, dimmer star. This variable star eclipse occurs like clockwork at intervals of 68 hours, 48 minutes and 59.9 seconds, or 2.86736 days. Because the entire eclipse takes 9 hours and 40 minutes from start to finish, the entire performance can be seen in a single night when the timing is right. The name Algol comes from the Arabic al-ghul, the female demon, but contrary to many popular accounts, the name apparently has nothing to do with the star's behavior. It is due merely to Algol's position marking the severed head of the Gorgon Medusa in ancient Greek constellation mythology. On the other hand, a 2013 paper published in the Astrophysical Journal by a team of researchers, suggests that a calendar for lucky and unlucky days composed in Egypt some 3,200 years ago, shows a distinct periodicity of 2.85 days and several empirical tests indicate that this periodicity just might be connected to Algol. The literal translation of Algol means, "The Mischievous One." Yet if the dimming of Algol was noticed by the ancient watchers of the night sky, the records say nothing about it. Normally, Algol appears 3.3 times brighter than during the peak of the eclipse; it usually shines at magnitude 2.1, about equal to the nearby star Almach in the constellation Andromeda, but when it's at minimum light, it fades to about magnitude 3.3, or about equal to the brightest star in another nearby star pattern, Triangulum. While diminished light lasts nearly 10 hours, the eclipse begins and ends so gradually that most of the fading and subsequent brightening takes place within the two hours before and two hours after mid-eclipse. So the eye of Medusa seems to "wink" at nearly three day intervals. This table shows the times for mid-eclipse of Algol for North America. Algol's variability was rediscovered in 1782 by the English amateur astronomer John Goodricke, an 18-year-old deaf mute. He observed the star systematically and determined its period. Amazingly, he also correctly suggested the reason for the brightness variations: A large, dim body orbits the star and periodically blocks much of its light from our view. The star is located about 90 light-years from Earth, and is actually made up of two stars in a binary system. The brighter star, Algol A is a bluish star about 90 times more luminous than our sun. The dimmer star Algol B is the eclipsing body. Algol B is a yellow star that is "dim" when compared to the brighter blue star, yet compared to our sun it is three times more luminous. Algol A and Algol B are both several times larger than the sun. Yet another star, Algol C, circles the A and B pair from once every 1.86 years. Algol C is a white star that is four times as bright as the sun. The whole complex system is a source of radio and X-ray emission. Algol, the Demon Star, is located about 90 light-years away in the constellation Perseus, where it can be found as one of the eyes in Medusa's head as seen in Johannes Hevelius' Perseus illustration from Uranographia. During the next month, Algol can be found about one-half to two-thirds up in the western sky as darkness falls. The star spends the rest of the night, slowly descending down into the northwest sky, and will be quite low to the northeast horizon by around 1 a.m. or 2 a.m. your local time. The table associated with this guide gives the dates and local times for the next four eclipses that can be observed from parts of North America in February and March. Daylight Saving Time has been accounted for in March. When an asterisk (*) is used, it means that the eclipse will occur not on the date listed, but on the previous calendar day. "N.O." stands for "Not Observable," since the eclipse takes place too near to sunset and the sky will simply be too bright to see the star. Two hours before the predicted minimum start checking Algol's brightness. If you are observing casually, a look every half hour is sufficient; if you are trying to determine the time of mid-eclipse, 10-minute intervals are better. Algol is at minimum light for about 20 minutes — as the large, dim star passes across the smaller, brighter one — then it gradually returns to normal.